The kitchen is one of the busiest rooms in the house – especially around the holidays. With all the cooking, baking and celebrating going on, it can be hard to keep the kitchen clean. To help you give your kitchen a holiday sparkle, try these timetested techniques from the pros at Merry Maids. Fridge Before putting containers in the refrigerator, wipe container exterior and securely cover it to avoid spills and reduce odors. Get rid of leftover items that have not been eaten or have expired. This allows room for new items. Save yourself this step by not refrigerating leftovers that anyone is likely to eat. Once a month, clean each shelf and bin one at a time starting from top to bottom. Remove items and wash with warm soapy water. Wash the walls, too. Dry thoroughly. All-purpose cleaners are safe for most surfaces in the kitchen, including stainless steel appliance exteriors. Before the big party, apply a stainless steel polish for extra shine. Remove finger prints from stainless steel with a glass cleaner, followed by buffing with a dry cloth. Whenever a product is used on stainless steel, the surface should be rinsed with plain, warm water and then dried to prevent streaking and water marks. Clean other refrigerator surfaces with a soap and water solution. Sink For stainless steel or ceramic sinks, rinse the sink after each use and wipe with a clean dry cloth. Drying the sink will prevent mineral deposits from building up on the surface. 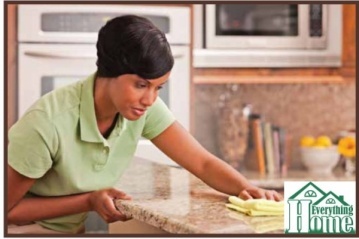 Once a week, scour the sink with a non-abrasive cleaner, such as an all-purpose cleanser or glass and surface cleaner. Do not use steel wool, wire brushes or abrasive sponges. If you want to make a stainless steel sink shine, use (shrinks a stainless in steel cleaner or a small amount of olive oil. Small Appliances To freshen up your disposal, fill it with ice cubes and slices of lime or lemon. Then, run cold water while the disposal is on for about 30 seconds. The ice will sharpen and clean the blades, and the citrus will release a fresh scent. If you have stuck-on foods in the microwave, fill a two-cup glass measuring cup with a cup of water and the juice from one lemon. Microwave for about 30 seconds or until the water boils. This should create steam in the microwave that will loosen stuck-on foods, so you can wipe the microwave clean. The lemon juice will provide a fresh scent. Wooden Cabinets For stubborn dirt, wash around all handles and any other grease zones with hand dishwashing detergent. Then wash the entire cabinet, including the handle areas, with an oil soap solution, such as Murphy Oil Soap. Just wipe lightly with the solution and buff dry immediately with a terry cleaning cloth. Always wipe dry with any grain or pattern. If cabinets are dull from wear or age, spray furniture polish lightly across the exterior to fill in the pores and restore the life of the wood. Do not use acids or powdered cleansers on cabinets. Use an allpurpose cleaner to spot-clean after heavy kitchen use. For more cleaning tips and information on Merry Maids, visit www.merrymaids.com.